MuscleSelect – 3dsmax MAXscript boost productivity during work with muscle objects. This script support muscle plugins: CAT, ACT, SkinFX, Hercules. Select All Muscle – Select 3 parts of muscle system. Select Muscle – Select base muscle object. Select Start – Select start helper object (for ACT Proximal). Select Start Handle – Select start handle helper object (CAT Muscle Strand only). Select End – Select end helper object (for ACT Distal). Select End Handle – Select end handle helper object (CAT Muscle Strand only). √ – Indicate currently selected part of the muscle system. SHIFT + Select Start – Select Start and End helper objects. 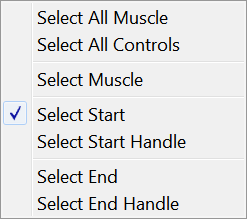 SHIFT + Select End – Select End and Start helper objects.For use the script you must select any ONE part of muscle system. Macroscripts (.mcr) should be placed in maxroot\UI\Macroscripts, and are then accessed through the “Customize User Interface” menu in 3dsmax. You can then assign the script to a keystroke, or a button. All macroscripts will appear under the “veda3d.com” category in the drop-down. v1.0.3 (11.11.2012) – Added “Select All Controls” which select all controls of muscle object. – Now with SHIFT + “Select Start Handle” or SHIFT + “Select End Handle” selects both Handle objects. v1.0.2 (25.11.2008) – Now “Select All Muscle” and “Select Muscle” of Muscle Strand(CAT) are fully support. AVG extension is needed for 3dsmax < 2008. – Now with SHIFT + “Select Start” or SHIFT + “Select End” selects both Start and End muscle parts. v1.0.1 (30.09.2008) – Fixed bug when non muscle part object selected. – “Select All Muscle” now selects and _Up node of SkinFX muscle. v1.0.0 (08.02.2008) – Initial release for MAX 2008.